SO much is forbidden by religion, that it is easy to forget the joys in celebrating religious traditions. “Soul Doctor,” tells the story of Rabbi Shlomo Carlebach, whose music in praise of peace and understanding was both liturgical and secular. (See rehearsal video at top). The biographical musical, at Circle In The Square in an open run, is based on SC’s autobiography and his songbook, with ministrations from his daughter Neshima, a book by Daniel S. Wise and lyrics by David Schechter. It’s possible that the bio behind this musical is fuzzier than most in this genre, however. 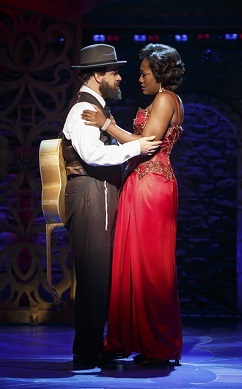 Eric Anderson as Rabbi Shlomo Carlebach and Amber Iman as Nina Simone in "Soul Doctor." Photo by Walter McBride. Should this have an impact on the way “Soul Doctor” is viewed? Does it affect the quality of the slice of life “Soul Doctor” depicts? A resounding “no” to both may be disingenuous, but “Soul Doctor” on its own merits is marvelous entertainment … More shortly. Visit http://www.bit.ly/1crTzLo to learn more about "Soul Doctor."